SportsLine's advanced computer model simulated Phillies vs. Mets on Wednesday afternoon 10,000 times. The New York Mets have the best road record in the National League, but that will be tested on Wednesday when they play the Philadelphia Phillies at Citizens Bank Park. First pitch is slated for 1:05 p.m. ET. 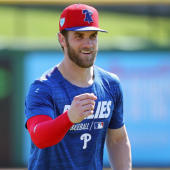 Jake Arrieta (2-1, 2.25 ERA), who earned his 100th career victory on Friday, starts for the Phillies, while the Mets counter with Zack Wheeler (1-1, 7.47), who is coming off a quality start after a pair of subpar outings to open the year. The current Mets vs. Phillies odds show Philadelphia as a -120 favorite on the money line, (risk $120 to win $100), down from an open of -130. The over-under, or total runs Vegas expects to be scored, is nine after rising as high as 9.5. You'll want to see the MLB predictions from the proven model at SportsLine before locking in any Mets vs. Phillies picks of your own. This model, which simulates every game 10,000 times, has raked in the winnings for those following its picks in multiple sports. It is off to a profitable start on all its top-rated MLB picks this season, entering Week 4 on a strong 38-24 run. Anyone who has followed it is way up. Now, the model has zeroed in on Mets vs. Phillies. We can tell you it is leaning over, and it also says one side of the money line has all the value. You can only see that pick at SportsLine. The model knows the Phillies have the advantage on the mound with Arrieta, who has allowed just five runs and 13 hits over 20 innings. Batters are just .191 against him this season. The Phillies also added bats in the off-season, and it's paying off. They rank eighth in the league in scoring, with the top-three hitting players on the team -- Jean Segura (.323), Andrew McCutchen (.273) and Bryce Harper (.268) -- all new players from a year ago. They have a run differential of plus-one this season compared to minus-0.53 for the Mets. But just because Philadelphia has a hard-hitting lineup doesn't mean it provides value on the Mets vs. Phillies money line. Wheeler's numbers haven't been great, but after two rough starts he was solid at Atlanta on Friday, allowing two runs over six innings with eight strikeouts in a win. The Mets' offense has banded together on the road, averaging a hefty six runs per game with a cumulative .274 batting average. Pitching was expected to be New York's strength this season, but so far the team is averaging 6.1 runs per game, fourth-most in MLB. Rookie Pete Alonso has been the catalyst of much of the success, hitting .339 with six home runs and 17 RBIs, all team highs. So who wins Mets vs. Phillies? And which side of the money line is a must-back? Visit SportsLine now to see which side of the Mets vs. Phillies money line to jump on Wednesday, all from the advanced model that has crushed its MLB picks, and find out.